Livonia, MI – ATEQ, world leader in tire pressure monitoring system tools, announced the newest innovation in TPMS system relearn technology. ATEQ’s patented technology called “Sync-ID” will standardize the way TPMS sensor information is transmitted to the vehicle’s ECU, using a unique, OE-compliant OBD relearn procedure for all equipped light-vehicles. A TPMS relearn procedure is a set of instructions that must be followed to activate and confirm the TPMS communication from the TPMS sensor to a vehicle’s ECU. All vehicles equipped with TPMS sensors must perform a relearn procedure after a service has been performed to the TPMS system. For example: a relearn must be performed during a sensor replacement. Relearn procedures for direct-TPMS systems include auto-relearn, stationary (sometimes called manual) and OBD. The steps are determined by the auto manufacturer and vary from vehicle to vehicle. With ATEQ’s new “Sync-ID” technology, technicians only need to learn how to perform one unique OBD relearn procedure for all vehicles with direct-TPMS systems, rather than hundreds of different procedures. 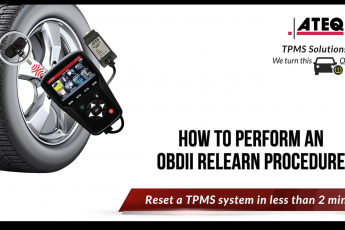 Technicians will love this new feature, now they can skip the long and complicated stationary (manual) relearn procedure steps, and in just a few steps, use the OBD relearn procedure to reset the TPMS system in less than 2 minutes with a non-intrusive technology, using OE-compliant standards. Sync-ID, which is available on the VT56 TPMS tool since March 2018, now includes OBD procedures for brands such as BMW, Jeep, Ford, Fiat, Chrysler, Alfa Romeo and many more. 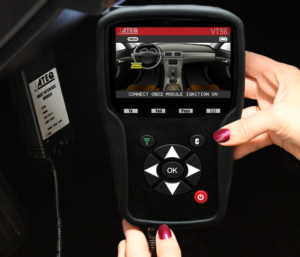 Current and new VT56 tool users can easily get access to the new Sync-ID and hundreds of new OBD procedures, simply by updating the tool’s software. Only a valid tool license is required. Auto-relearn procedures require a technician or a customer to drive the vehicle to relearn the new set of TPMS sensors’ IDs. This is not only time consuming, it is also complex to determine which vehicle has this function and which doesn’t. In addition, shops are reluctant to let a customer go without having relearned their customer’s vehicle. Stationary relearn procedures (or manual relearn procedures) includes one or several manual steps. For example, a 2012 Ford Taurus requires 12 steps to relearn the TPMS system. If technicians perform one step wrong, they will have to start all over again, causing confusion and costing time. 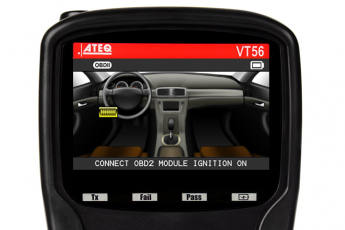 OBD relearn procedures require to use the OEMs diagnostic tool or a VT56 tool. OBD relearn procedures are becoming standard in a shop environment for many reasons. First and foremost, it is the easier to work with since the same procedure can be performed no matter what the vehicle type is. Secondly, OBD relearn saves time and confusion for the technician since there are fewer steps to perform. The VT56 TPMS tool displays the steps necessary to communicate the TPMS sensor information to the vehicle’s ECU. The tool also shows where the OBDII module should be connected to the vehicle. Once the steps are performed with the VT56 and the OBDII module is connected, the information is transferred from the OBDII module to the vehicle’s ECU. ATEQ TPMS Tools Lança Vídeo "Como Realizar um Procedimento Fixo (Manual)"